Q-1 Which of the following is a valid condition for a party to be National party? a) A party which has secured six % (6%) of valid votes polled in any lok sabha election or assembly election in the state and atleast four such states and secured 4 Lok Sabha seats. b) The party has secured atleast 2% of total no. of seats in lok sabha from atleast 3 states. c) The party is recognised as state party in atleast 4 states. Q- What is a tenure of State Governor? Q- Who administers the oath of a State governor ? According to Representation of People Act, 1951 there is provision to conduct elections of the Houses of Parliament or Houses of the Legislature of State. As per this law there are two parties – a) Recognized Party and b) Unrecognized Party. i) A party which has secured six % (6%) of valid votes polled in any lok sabha election or assembly election in the state and atleast four such states and secured 4 Lok Sabha seats. ii) The party has secured atleast 2% of total no. of seats in lok sabha from atleast 3 states. 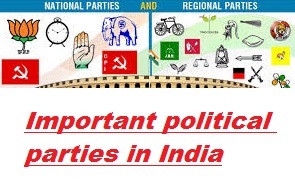 iii) The party is recognised as state party in atleast 4 states is called a “ National Party”. A Party which has secured at 6% of valid Votes polled in the Assembly election in the State and atleast two MLAs. The party has secured atleast 3% of the total no. seats in the assembly of the state. The party has secured at least 6% of valid votes in the lok Sabha election in the state and atleast 1 lok sabha seat is called a state party. This Status is not permanent, it can be withdrawn by the election commission if the performance of the Party goes below the parameters. There shall be a Governor for each state provided that the Same person can act as Governor of two or more states. Simply appointed by the President. Should be a citizen/35 years/ no office of profit. c) The oath is administered by the Chief justice of High Court. d) The Salary is decided by the Parliament which is charged upon Consolidated fund of India. e) Pardoning Powers : He has this provision but shall not pardon death sentence and shall not enter in the case of Military Courts.